Enjoy the full value of a proven 3-part approach from one of Canada’s most respected investment advisors. He will help you maximize your total returns and prepare a future free of financial worries. Pat McKeough is one of Canada’s most respected safe-money advisors. As early as 1980 he was recognized as #1 in the world of published investment advice by the Washington, DC based Newsletter Publishers Association. Pat has profitably guided his readers through the crash of 1987, the downturn of 2001—2003 and, most recently, the 2007—2009 market crisis. A best-selling Canadian author, he wrote Riding the Bull, his 1993 book that predicted the stock market boom that happened later in the decade. He was also the first multi-year winner of The Globe and Mail’s Stock Picking Contest. Save $50.00 when you subscribe to The Successful Investor, the advisory that shows you the most profitable low-risk investments. 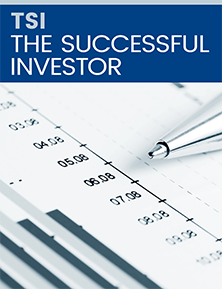 Click the button below to claim your FREE Special Reports when you subscribe to The Successful Investor. Many investment advisors say be ready to profit when opportunity knocks. I say opportunity is always knocking. You just have to know when and how to act. When you act on the right stocks, the profits can be staggering. I have helped many investors do just that. And I can help you. My name is Pat McKeough. And I’d like to give you two examples of how I was able to help investors make profitable choices in an uncertain market. In the summer of 2009, the stock market had rallied off its March lows. Many cautioned that it was time to pause. I disagreed. “This is an extremely attractive time to buy,” I said. Investors who followed my advice were about to reap a rich harvest. The markets kept on rising. Many good stocks that had been down rebounded and rewarded investors. Similarly, in 2012, the European debt crisis and the so-called “fiscal cliff” faced by the American government prompted an endless stream of pessimistic forecasts. I continued to insist that “these problems are old news; investors have had plenty of time to adjust to them.” What’s more, stock prices were attractive on a historical basis compared to earnings. Sure enough, stock markets had rallied before the end of the year and continued to move up into the next year. It wasn’t difficult to make these calls. I have many years of experience in the markets. More important, I have developed a consistent approach over those years. That approach to investing has worked over and over again in good markets and bad. I can trust it, and so can the investors who rely on my advice. You will find it in The Successful Investor, my flagship advisory. My approach to investing is conservative. It puts a premium on safety. Yet it has given investors just like you spectacular gains on many stocks that have soared. This is no contradiction. It makes perfect sense when you follow a proven system of investing that has made money consistently in every kind of market. You can try this system with an introductory subscription to The Successful Investor for one full year (12 issues) at our lowest possible rate. I will also send you 6 Special Bonus Reports FREE—including my exclusive Investor’s Guide. In a moment, I’ll tell you how you can take advantage of this special offer and save $50.00—and more. But first, let me give you a specific example of how we go about making the successful stock recommendations our readers receive in The Successful Investor. Winning stocks that go on a surge are not always lesser-known up-and-coming companies. They can just as easily be well-established stocks that have receded or have hidden value that the markets have not yet fully recognized. Or both. CP Rail began a strong rise in the latter half of 2012 and rose over 40% from the time we picked it in January 2012 to the end of the year. It continued its rise into the New Year. Let me stress this again. My approach is not a stock-picking circus in which we simply advocate going out on a tightrope in search of high-risk growth stocks. To gauge their performances, investment advisories around the globe turn to one undisputed authority: Hulbert Financial Digest, a service of Dow Jones MarketWatch. Hulbert’s ratings are based on the cold, hard facts—actual risk-adjusted returns. It is based on the old-fashioned virtues of value and diversification. Next, I’ll tell you exactly what sets my stock-picking system apart. Your goal is to achieve the greatest possible gains with the maximum safety. My goal is to give you a combination of outsized profits and minimal losses. Some insist you should have nothing but blue chip stocks and others would have you load up on hot growth stocks. But you only build real wealth when you have the best of both. I believe no portfolio is sound without a foundation of solid dividend-paying stocks. But I also believe every portfolio is incomplete without the fast-growing stocks that earn you big capital gains. My approach is designed to give you the greatest chance of success by alerting you to the best stocks in both categories. It is based on three principles from which I never vary. Invest mainly in well-established companies; they have the experience to survive and prosper despite setbacks. Spread your money out across the five main economic sectors; in any setback, some sectors do much better than others. Downplay or avoid stocks in the broker/media limelight; that’s where failed predictions can do the most damage to your finances. And the “hot” stocks hyped by brokers and the media are liable to enrich the people promoting them much more than they enrich you. Most investors get in after the best gains have already been made. I look hard for value in both kinds of stocks. A lot of people simply assume there is value in blue chip stocks. But some have much more powerful growth in store than others, along with those welcome dividends. Other so-called “blue chips” are riding more on past reputation than present performance. Many people also assume that you have to get lucky with hot growth stocks— catch lightning in a bottle—in order to make big gains. Yet my approach has turned up spectacular winners time after time. Luck is the residue of design, one famous executive said. I work hard so that you don’t have to be lucky. You can count on me to find the value that makes a stock a solid pick, not a gamble. In fact, a well-known stock can turn into a hot growth stock under the right conditions. Or it can be taken over—and we have had an exception history of recommending takeover stocks. Last year, for instance, Gennum rose 119% in a day when a takeover bid was announced. Ultimately, it is the quality of the stock that counts. When we search out potentially hot growth stocks, we look for established companies with hidden value that the market hasn’t yet recognized, not start-ups or stock promotions. If you keep your portfolio properly diversified, you will cut your losses and increase your gains. Anyone can tell you that, really. But the losses will be less and the gains will be much greater when you have covered the different sectors of the economy. Your introductory subscription to The Successful Investor is backed by my iron-clad Money-Back Guarantee. If you are unsatisfied for any reason, you may cancel at any time, and I will refund 100% of your subscription fee on unused issues. Everything you have received from us is yours to keep, including the 6 Special Reports I send you as my thank you for subscribing. You have no long-term risk whatsoever. These sectors have their own characteristics. Over the years, their performance is predictable. Finance and utilities are the most stable and offer some of the highest yields. Manufacturing and resource stocks are the most volatile and cyclical. Consumer stocks fall somewhere in between. As a general principle, you should have stocks in all 5 sectors. How you distribute those stocks will depend on the amount of risk you’re willing to accept and how much current income you need. My job is to help you do this by finding precisely the right stocks for your needs. Whether you’re more conservative or more aggressive, you will find stocks in The Successful Investor that will suit those needs. Always keep this in mind. A successful portfolio will do two things. First, it will weather economic downturns. A good dividend paying stock will keep sending you those cheques even if the shares are lagging. Second, good stocks are the first to take off when the economy and the markets rebound. Good stocks suffer through no fault of their own during a sell-off. They have the built-in value to rebound. Better still, you can buy these stocks or add more shares at discount prices while the market’s down. You must also know how to get rid of junk. For instance, if a supposedly reliable stock slashes or eliminates its dividend in times of trouble, it’s probably been masquerading as a solid stock and trying to hide some festering problems on the balance sheet. With my time-tested system, I will help you put together a successful portfolio by separating the wheat from the chaff before you buy. I will also let you in on two of the secrets I have for selecting the right stocks. The investment world responds to earnings reports. Shares rise and fall almost instantaneously on a good or bad report. It is certainly in the interests of a company to make its earnings look as attractive as possible. And many will do anything they can to dress up their reports. That makes earnings reports inherently unreliable right from the start. There are plenty of accounting manoeuvres—deductions for goodwill, depreciation and so forth—that can make the numbers look better than they actually are. I don’t let those numbers distract me from the company’s real bottom line. But it’s also true that a company with a disappointing earnings report is sometimes giving a more honest—and appealing—picture of its prospects. If that company is working diligently to solve temporary problems, or taking one expensive step backward in order to take several very profitable steps forward, it is probably a better investment than a company with a flashy but suspect report. A good example is grocery giant Loblaw (Toronto symbol L). In 2010 the company was plagued with problems in its warehouses and its computer network as well as disappointing results from its new superstores. Yet it had a number of assets, including the strength of its brand name and the enormous value of its real estate holdings (a classic case of the “hidden value” we talk about in the next section). Loblaw undertook an extensive program of capital upgrades to its supply network, computers and stores. Then in 2013 it converted its real estate holdings into a real estate investment trust (REIT). We turned Loblaw from a hold to a buy in July 2011. The stock has risen steadily and given every indication there was much more growth ahead. It is my job to pull back the curtain and to separate substance from show. Just as reported earnings don’t really tell us how profitable a company is, its balance sheet doesn’t always reveal the true value of its assets. Some of a company’s most valuable assets—like its so-called intellectual property—are carried on its books at nominal amounts. That includes patents, customer lists, brand names and so forth The most famous case is undoubtedly that of Coca-Cola, which reputedly carries its “secret formula” on its books at one dollar. It also includes real estate, which is carried on the books at the original price and fails to reflect its current market value (as seen very clearly above in the example of Loblaw). Similarly, the books can’t tell you about a company’s crucial market position, or a long-standing customer base to which it can sell new products and services. I seek out these hidden assets. And readers of The Successful Investor have made remarkable profits over the years from companies with these assets. Now here is what you get when you accept my special offer to try a risk-free introductory subscription to The Successful Investor. Your Monthly Advisory. You will see clearly just how to put together a successful and balanced portfolio. Above all, you get honest buy and sell recommendations. There is no waffling or broker-speak. I tell you exactly what I think of a stock. Whether it is a buy or a sell, I give you a candid picture of its strengths and weaknesses. You have all the information you need to act with confidence. Every month, you get a clear-cut explanation of how these stocks are reacting to the market and the economy, all written in straightforward, understandable English. E-mail and Telephone Hotline. You get regular updates on the stocks we cover. My approach does not call for frequent trading, which can be costly for investors. But events occur between issues that require you to take immediate action. With our hotlines, you always know when and how to act. You get monthly portfolio updates that track the progress of previous recommendations so you see at a glance how well you’re doing. You also see just how each investment fits into your portfolio strategy. I help you make the most of that strategy with three portfolios that represent three different levels of risk tolerance. Conservative Growth Portfolio. This is the core of our service. This is where you should invest the bulk of your stock market money. It holds many major Canadian companies, although some big names are missing—it takes more than mere size or popularity with brokers to win a place in this portfolio. Portfolio for Income Seeking Investors. This portfolio has high standards of safety and stringent tests for inclusion. Income investors trust it, and they have been rewarded. The yields range from under 1% all the way to over 9%. And the stocks have risen in price as well, with eye-opening gains as high as 775% and 755% since we made our recommendations. Aggressive Growth Portfolio. Many of the companies in this portfolio eventually make it to the Conservative Growth Portfolio, but they need to prove themselves a little longer before they get the upgrade to that portfolio. That means they’re more uncertain than our Conservative Growths stocks, but it also means they have more room to soar to mind-boggling gains. Access to Previous Hotlines and Back Issues. Included with your subscription, you also have access to all previous hotlines—you have a complete backlog of advice on the stocks we’re following. You also receive the past 10 years of back issues for The Successful Investor at no extra cost whatsoever. You have a library of knowledge on Canada’s leading stocks at your fingertips. You’re never in the dark when it comes to making important investment decisions. My Personal Investor’s Guide. I have detailed my approach to investing in one revealing report, Triple Your Wealth & Slash Your Risk: How to Generate Outsized Profits in Uncertain Markets. This 7-volume set provides complete details about my reduced-risk, high-return philosophy, with a wealth of examples, explanations, tools and worksheets to help you profitably apply my time-tested approach to your own portfolio. This in-depth report is yours absolutely free with your subscription. In addition to all the benefits you already receive with your low-priced introductory subscription, I will also send you these 6 timely reports as soon as I receive your subscription order. They are yours FREE with my thank you. Exclusive Special Report #1: How a “Conservative” Broker Can Empty Your Account. If your wealth isn’t growing as fast as you think it should, even though your broker is “doing everything right,” you’ll want to read this eye-opening report. It’s the true story of what happened to one of my clients when he put his faith in a supposedly reputable broker. Exclusive Special Report #2: 3 Little-Known Strategies to Help You Thrive in Today’s Market. No one can consistently predict what the stock market will do next. Stock prices don’t operate on a regular schedule. But factors such as dividends and earnings potential indicate stock prices should be higher in the next couple of years. These three key strategies will help you make the most of these opportunities—and build a powerful portfolio that can stand up in all markets. Plus we name three stocks that could be ripe for a rich takeover in the next few years. Exclusive Special Report #3: The 5 Stocks You Must Have in Your Retirement Portfolio. This is essential information if you want to protect your nest egg and not see it waste away. I offer my best-of-the-best recommendations to safely help you conservatively protect and grow your wealth. Exclusive Special Report #4: 20 MORE Stocks You Need to Dump Now. My most recent list of 20 losers most posted sharp declines. In this new updated version, I reveal the names of stocks our stock-picking system has indicated must be dumped right away. Exclusive Special Report #5: 5 Essential Resource Stocks for Conservative Investors. In this report, I name 5 natural resource-related companies that I see as bargains waiting to explode as emerging market demand heats up. Combined with my investor’s guide, Triple Your Wealth & Slash Your Risk: How to Generate Outsized Profits in Uncertain Markets, the total value of these 6 reports is $179.50. Add that to your $50.00 savings on your introductory subscription, and you save more than $200.00 for one full year (12 issues) of The Successful Investor PLUS the free reports and all the other extra benefits you receive. And all this is fully protected by my personal Money-Back Guarantee, which says that if you are ever unsatisfied, you may cancel at any time. I will refund 100% of your fee on the portion of your subscription that you have not used. You may keep everything we have sent to you, including the 6 FREE reports. You have no risk. In recent years, investors have been faced with worldwide financial crisis, economic worry and challenging markets. Yet those who were able to take a calm, informed approach to the market were able to hold their ground—and be ready to reap the most profitable opportunities when the markets rebounded. It is for this reason you should not be without my proven, conservative approach to investing that helps you protect your money even as it uncovers exceptional opportunities for profit—whatever the markets are doing. There is no better time to take advantage of this very special offer and begin your subscription to The Successful Investor now.